As a homeowner, you have probably already had your share of plunging a clogged drain or two. You have probably handled a few simple plumbing tasks in the home that made you feel like you can take care of your own plumbing problems. However, this is nothing compared to trying to fix a pipe that continues to leak. There are times when you will have emergency plumbing issues, and you will need to have a plumbing professional on hand that you can call 24/7. The truth is that you never know when you are going to experience a bad plumbing complication, and there are a few that require the attention of a licensed plumber. Leaky pipes are one of those troubles that you see coming before it hits you hard. You start to notice that your water bill is increasing, even though the usage level is about the same. You may even find yourself hearing the sound of water running within the walls. These are all definite signs that you have a water leak glitch somewhere in your home. Not to mention, the moisture levels in your home start to shoot up. 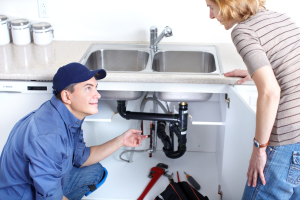 It is very difficult for someone without the proper training to locate the exact location of a leak and fix it themselves, which is why it is imperative to be able to contact your plumbing company 24/7. Because they have possession of leak detectors, you can expect them to find the leak and take care of it for you. Many homeowners have found their own remedies for clogged drains. With the use of strong chemicals being poured down the drain, it opens up in no time. However, this is not healthy at all for your drains. When you pour chemicals down the drain, you make them more susceptible to damage. The chemicals eat away at the walls of your drain, making them too weak. Basically, you are not fixing the problem at all, but rather causing more damage to your pipes. A professional plumbing service can come out and clear your drains using what they call snakes. This plumber’s tool is more effective and will not do any damage to your drains. Having a quality plumbing team on your side can ensure that plumbing issues are minimized. Having your broiler or water heater give out on you to where you can experience hot showers can be a real pain in the rear end. In order to repair a broiler, one must have extensive knowledge of the broiler and it’s part. Trying to fix a water heater without the proper training, education or tools could leave you with severe injuries in the end. There are many other plumbing issues to watch out for such as faulty faucets, low water pressure, broken toilets, faucet sprayers and much more. Sometimes a plumbing problem can actually be a sign of a bigger problem with your system. Having a plumbing company around that you can call 24/7 helps you keep your plumbing system in good shape and catch problems before they become major.